By far the most substantial work in the show, Connection should be the central jewel of the exhibition, and it is only because of the strength of the rest of the work that I cannot in all honestly state this to be the case. However, the poignancy of the work requires we visitors to view the piece in complete isolation from the room around; this work is about a kind of life-line through love, and the intimacy between the characters demands our attention. It was finished in 2008 but I started in 2007. They are two huge pieces, one weighs 45 kilograms, the other weighs 50 kilograms, and they are worked in relation to each other. When I first started doing them I dropped a dress size in a month because it was such hard work! It was incredibly physical, and working big pieces is incredibly dynamic and exciting. The lovely story about these is that I bought the two pieces of stone separately, and then we had the house converted so I could have a studio at home: the two pieces went away, were packed away together, and they came out together, and obviously wanted to be worked together. That is where I got the idea for a 'connection' from. I had had the idea that the bigger one might be Horus, but I didn't know much about Horus. I was doing an exhibition called 'Flights of Fantasy' which was about birds, and somehow Horus seemed to fit in with this. And then everywhere I went there seemed to be images of Horus; I went to a conference in Switzerland and there was a 20 ft brightly coloured sculpture of Horus! So I then explored the myth of Horus and found out about his relationship with Hathor his Queen. Horus was in a battle with his brother Seth, Seth gouged his eyes out, but Hathor bathed his eyes in milk and gave him back his sight (which is why the eye of Horus is such a lucky symbol in Egypt). The legend goes that Hathor his Queen takes him inside of her every night and gives birth to him anew every morning. So in the sculpture, Horus – the sun god – is giving rays of sun to Hathor his Queen. Hathor has the Egyptian ankh on her back, which is the symbol of eternal life, because she is the one who is giving birth to him again every morning. What is important is the gap between them because the 'connection' is the tension between the sculptures, so this space in the middle is important to me. Viv communicated this interaction beautifully. Approaching the sculpture from one side Horus's face is outward looking and protective, while from the other direction his eye looks directly into Hathor's face in an intimate exchange. These sculptures are positioned on an area of sand; this part of the gallery offers sight of a scene happening in a world beyond the gallery. We are privileged to hold the sight of such an exchange. The green alabaster stone has a different quality to other stones in the exhibition and the size of the pieces have real gravitas. They are like chess pieces or the Japanese netsuke sculptures: the forms are ancient and yet – because of Vivien's vision for shaping – utterly modern. On Monday 7th October Vivien Whitaker will be giving a talk at Towneley Art Gallery, Burneley, in which she will talk about her exhibition 'Source of Inspiration'. I got a sneak preview when I spoke to her just after we finished installing the exhibition. Now the exhibition is all up, how do you feel? Tremendously excited and tremendously pleased that it has all worked so well. I thought this was the best room in Towneley Hall when I looked round it 18 months ago, and the way the pieces sit in the room, with the light and the colours of the room, is just fabulous. What is wonderful for me is seeing the pieces that I haven't seen for some time together with my new sculptures, and the sculptures that looked incredibly big in my studio actually look just the right size here. And there is space for people to stand back and look at the sculptures, and most of them you can walk round, and that's fantastic because a good sculpture is one that is different from different angles, and needs to be seen from every angle. There have been some surprises: I was delighted when we realised that the dust montage 'Soul Window' matches so beautifully with Swan Preening, because the base of Swan Preening is frostily marble, which is the stone I'd used for half of the image for Soul Window and so we have placed those together in the exhibition. One of the things that people love – looking up at the ceiling – is a stone mobile, because it defies understandings of stone. I love the way it is hanging, and it is almost being a sun to Connection, which is set in sand because it is an Egyptian piece. I love the juxtaposition of those two. There musical or sound element of this exhibition. This is quite a new dimension to your work isn't it? I made the lithophone last year because somebody said to me, 'What are you doing about sounds? ', and I said 'well I don't know!' My lovely friend Alastair Anderson, the folk musician, suggested to me that I should make a lithophone (a stone xylophone). I tested all the stone I had to see if it rang, and there was just one piece that rang very well, so from that piece I have made a five note lithophone. There is an image of it in the exhibition, but it is too delicate, sadly, for people to play. However, I have asked various people to make compositions using it. Music student Chris Hobbs has created a composition using it, and also Barbara Mangles, and both of these are being premièred at the preview of this exhibition. And then another friend said to me: 'Wouldn't it be fun to have the sounds of the lithophone and the sounds of you working combined?' So my idea is that as people look at the sculptures they can listen to the sound of the lithophone and also the sound of me working. These are 'Soundscapes' because they are not what one would classically term 'music', nor are they designed to be something that reaches the top of the hit parade; their purpose it to be something that enhances the viewing of the sculptures. Why did you decide to make an interactive piece in 60 second sculpture? 60 Second Sculpture is another idea from Robert Shaw. He has three of my works and he asked if I could make him some blocks to put on his windowsil because he would like to be able to make his own sculptures and have the light passing through the alabaster everyday. I took that idea and thought it would be fantastic for an exhibition, because everyone wants to be able to touch the sculptures but can't. I thought it would be nice to have a challenge for people, so the blocks are all different sizes, they have different textures on different sides so they are interesting from a tactile point of view. I was particularly thinking of a friend of mine who is blind, and I have made her a touching sculpture; I was thinking about making the surfaces different from the point of view of people who can't see. There is a hole in one of the sculptures as well so they are easy to hold if you are very small. The idea is that everybody comes and has one minute to make a sculpture using the five blocks. Have you got a favourite sculpture? The sculpture which I think is the best sculpture in many ways is Inside the Scream. It is quite a disturbing piece (it has reduced someone to tears) and there can be different interpretations: someone saw it as two dolphins leaping, though that's not the origins of the sculpture. What makes it a good sculpture for me is that there are strong turning points so your eye is led round the sculpture, and also it looks dramatically different from each angle. There is a very strong hole through it: going through a hole is interesting because it adds a different dimension to the sculpture, which is the dimension of time that it takes your eye to pass through the hole. The piece of alabaster itself is extraordinary; its very translucent, it looks almost like you are looking into a brain, and that's the very disturbing element of it. It has also got things that look like wings coming out of it, and there's a very interesting part where I have left some of the rough stone to contrast with the highly sanded, sealed stone, and so both visually and from a tactile point of view you get a contrast. Hush Wing is one of the earliest works in this exhibition, and it shows the beginnings of Viv's preoccupation with birds. Such a concern seems strange given that her chosen medium is stone, but – as with the mobile I Wish I Could Fly – Viv is able to promote the sense of freedom and weightlessness through something so permanent. This particular piece is certainly substantial and seems to defy gravity in that it is only connected to the base in one small area. In being only lightly representation it beautifully evokes bird in flight, but the monumentality of the piece acts as a bold and definite celebration of the very concepts that the bird in flight stands for. Vivien Whitaker has developed unique ways of sculpting sensuous stone that enhances its elemental essence and resonance. She does not work with hammer and chisel as this 'bruises' the stone. Vivien sculpts using metal files and rifflers, using rhythmic repetition, which stimulates a process she terms 'independent hands' where her hands start working in ways her head didn't have in mind. 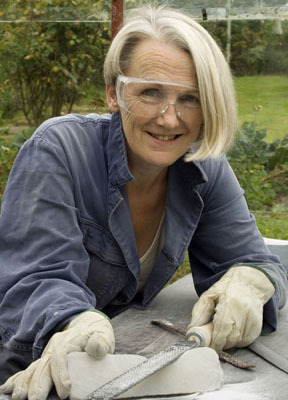 Vivien trained with Peter Hibbard, a former assistant to Henry Moore, is an elected member of the Royal British Society of Sculptors and has a First class BA (Hons) in Art and Design. 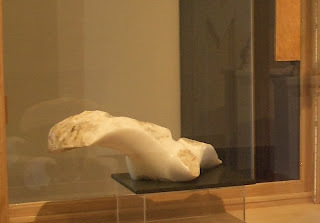 Her alabaster sculpture ‘Selkie’ is displayed in the ‘About Art’ room in Weston Park Museum, Sheffield and her joint work (with Alison Counsell) ‘Beyond Venus’ is part of the current ‘Designed to Shine’ exhibition at the Millennium Galleries, Sheffield. Her sculptures are in many public and private collections around the world. For more details visit www.vivienwhitakersculpture.com. During the last few days I have had the privilege of again working with Vivien Whitaker in order to assist with the curation and hanging of her first retrospective – 'Source of Inspiration' – which opens at Towneley Art Gallery in Burnley this weekend. This perfectly formed exhibition features most of the major works that Viv has created over the last eleven years. All of the works are crafted from the English Alabaster stone, a stone that has a long and wonderful history in sculpture, but on display in this exhibition are the carvings of some of the last pieces of the Alabaster to be mined in the UK. It is, therefore, an historic display, and in her pieces Viv gives a nod to the traditions of using the stone in the middle ages (mainly for church decoration), as well as to the style of the twentieth-century giants of Henry Moore and Barbara Hepworth who often carved using English Alabaster. Over lunch I chatted to Viv and asked her about how she felt about the exhibition. Why did you decide to hold this – your first retrospective – here in Burnley? I was born and brought up in Burnley, and Towneley Art Gallery was the first art gallery I ever went to as a child. It was a place I came to very frequently and was my first experience of art; I think that was very inspirational. That is one of the reasons why we have called the exhibition 'Source of Inspiration', but this title also refers to the medium that features in the exhibition. I have been carving the last of the English Alabaster for the last ten years and that has been a huge source of inspiration for me. Can you remember what was here when you used to visit all those years ago? Bill the big bear; in my day you could touch him, but these days you can't. But I think it was seeing lots and lots of different kind of visual art which really made the impression on me. Tell us a bit about your journey in getting to this exhibition. I started carving Alabaster in 2002, so it has been eleven years, but this exhibition has been 18 months in the making, and it has been very exciting. Typically I do joint exhibitions so I do the bit in the middle and someone else does the walls, but having this solo exhibition was a huge challenge. As a direct carver I don't make sketches or anything like that so I have literally nothing to put on the walls. One of my collectors – Robert Shaw – said to me 'What do you so with the dust' and I said 'Well I put it on the compost heap, what else would you so with it?' He said 'Why don't you make something with it?' This big challenge has been something that has evolved to be the Dust Montages, which are three-dimensional collages made of alabaster dust, chippings from the carvings, mixed with a whole range of different media. Very experimental. I went back to the middle ages when they made tempura with egg yolk, and I mixed some of it with egg yolk which, with the red dust produced a very vivid orange, and I thought I had better cover that with varnish fairly quickly in case it started to smell. I also experimented with how I put things on, so I used pine cones and ferns, and feathers rather than painting things on. With one of the other dust montages – Exploding Star – I flicked mixtures (in a very Jackson Pollock way) across the horizontal aspect, which was great fun. With the third montage I built up using sculptural clay to create a very different effect. What was your vision behind the selection of the works? One of the special things for me is to get work from the whole ten year period so that people – including myself – can see how my work has developed over the whole ten years. My private collectors have been very generous because they have allowed the works to come out for the exhibition. This is the first time that I will have seen my major pieces together, never mind anyone else. I have another set of works in private collections which – because of their delicate nature – we were unable to bring up for the exhibition. We were still very keen to have them represented in the display so I have produced gicleé prints of those works to hang on the walls. What does it mean to you to have a Retrospective? It feels fabulous! It feels the right time because I have just carved the last large piece of English Alabaster: from an Alabaster point of view there is no more English Alabaster left. It feels like an ending. The soundscapes that will be played at the exhibition are something that I have created from the sounds of the Alabaster lithophone that I made, along with sounds of me working, and I have called it The Last of the English Alabaster. For me it is a very poignant piece; it very slowly fades away, which for me is about the history of English Alabaster, how it has been used and also how now not only is there not much of it left, but people don't see much of it either. It is really important to me that visitors to the exhibition are able to see all of these last pieces of the English Alabaster: they can see it in the public collections, but this will be the only time they can see my works that are in private collections, which are some of the most dramatic pieces. Vivien Whitaker's Retrospective 'Source of Inspiration' is on at the Towneley Art Gallery until 12th December. John Singer Sargent’s portrait of Lady Agnew of Lochnaw packs a punch today as I’m sure she did when first painted. Painted in 1892, this striking depiction of a young society woman speaks of gender relations, power and modesty in a time when all these ideas were beginning to be challenged and redefined. At the time of painting this work Sargent was living in London where he had moved in 1886. He was making his living as a portraitist, painting predominantly female portraits, and in the period between 1882 and 1904 he exhibited 75 portraits at the Royal Academy in London. Sargent had spent years carefully establishing himself as a portraitist, regularly sending work to England and America where he surely assumed he would one day settle. In his early career, when he was working in France, his work had been seen as ‘daring and provocative’;  Sargent was aware of the influence of the institution of the Salon, and whereas a more cautious new artist would have attempted to mould a career by working within the conventions of such an establishment, Sargent sought to challenge the Salon and carve out his own modernist style. His work challenged the traditional understanding of ‘good taste’ and often received high praise from critics, though in his early career he did not achieve the acclaim and reputation necessary to receive large amounts of commissions. In 1884, any reputation he held was shattered by the reception of ‘Madame X’ in the Salon; this actually received mixed reviews but the condemnation of the Salon ensured a major setback for the young artist. Sargent’s portrait of Lady Agnew was actually instrumental in his return to favour and in marking the start of his highly successful late career. Although this work was certainly no less audacious than many of his earlier portraits, it seemed that fashions were shifting and Sargent’s style was becoming more acceptable. When this painting was exhibited in the Royal Academy in 1893 it received rave reviews with the London Times stating that it was ‘not only a triumph of technique [emphasis original] but the finest example of portraiture in the literal sense of the word, that has been seen here for a long while’. This work was well received by the public as well as critics, and launched Lady Agnew as a new society beauty. But how did Sargent’s conception of Lady Agnew fit with contemporary attitudes towards women? Many art historians looking at the depiction of women in art have acknowledged womankind as a kind of ‘category’ or ‘symbol’. She is representative of a series of relationships, and also of social order; as Griselda Pollock writes, ‘the category of Woman is of profound importance to the order of society’. Misogynist theory is explored further by Pollock in the perceptions of women as objects to be exchanged between men; as ‘all culture is to be understood as exchange and therefore as communication’ it is possible to assess Levi-Strauss’s argument that ‘the exchange of women between men is the foundation of sociality’. Such situations of possession and exchange of women by men in an overt manner are far from our Lady Agnew, but perhaps in the ownership of such a portrait comes a sense of possession of the subject. This painting is of a newly married woman – Gertrude, the new wife of Sir Andrew Noel Agnew – so unlike many of Sargent’s female portraits the subject is not an available young debutante. The attitude of Lady Agnew is very different from the serene and modest painting of ‘The Misses Vickers’; there is a sense that this woman would not allow any objectification of herself, or any trading in ownership. In his book ‘Ways of Seeing’, John Berger argues that ‘the social presence of a woman is different in kind from that of a man.’ Any perception of man is always directly related to understandings of personal power, whereas ‘a woman’s presence expressed her own attitude to herself, and defines what can and cannot be done to her’. Berger claims that women – unlike men – are raised to be aware of how they appear to the outside world, and through this she herself becomes the ‘surveyor’ and the ‘surveyed’. Though this argument now seems a little dated, such a theory is certainly convincing for a model of perceptions of women in the late nineteenth century. Lady Agnew herself is distinctly aware of how she appears; her pose, which we read as being a kind of commanding nonchalance, is consciously choreographed. But Berger takes this argument further. He states that these two parts of the woman’s identity – the surveyor and the surveyed – are male and female respectively; thus a part of the female herself is masculine. Under this argument the surveyor is so strongly associated with being masculine that even the quality found in a woman is characterised as ‘male’. This addresses the so called ‘politics of the gaze’, asking the question ‘does the process of looking itself involve relations of power’ and if so, what are these relations? Berger argues that in these conflicting parts of the female identity ‘[the woman] turns herself into an object – and most particularly an object of vision: a sight’. This is exactly what Sargent’s portrait is; Lady Agnew is ‘a sight’. All aspects of the painting make it a sumptuous vision to be devoured by the viewer: the opulent interior, the lavish dress, the extravagant jewels, Lady Agnew herself, even the materiality of the brushwork with which Sargent models the subject, all contribute to the spectacle of the portrait. It is also worth considering the role of the public in works such as this, and in the case of this portrait there were various ‘publics’ to be satisfied. There were the art critics of the Royal Academy where the work would be displayed, there was the wider crowd of socialites who would both judge the character and reputation of the sitter and be potential patrons for Sargent’s future work, there was Sir Andrew himself, the patron, and finally Lady Agnew. TJ Clark has stated that ‘in the greatest portraits we can see the tension between the sitter as subject matter and the sitter as public’ and we certainly get this sense in Sargent’s painting; as already stated, this work has complex ideas of the gaze, with the subject as an object to be viewed, but the subject herself has a highly charged gaze of her own, thus complicating the treatment of her as a sight to be consumed by the public. If we adopt Gill Perry’s model for assessing gender in painting, we must consider the gender of the artist and of the sitter, how gender relations are presented in the work and in a particular social environment, whether the technique of the work itself is gendered, and how the gender of the viewer will affect any interpretations. Firstly, we can acknowledge the relationship between the male artist and the female sitter. Sargent maintained that his portraits were entirely about the appearance about his sitter and that he was not at all concerned with presenting the personality beneath, so much so that in 1888 he was criticised by a reviewer in the New York Times for painting portraits that were ‘all surface and no soul’ depicting women who ‘[could] hardly be ... as flint and impudent in character as they appear. However, certainly from this point in his career, it is likely that this statement was merely an insurance policy. 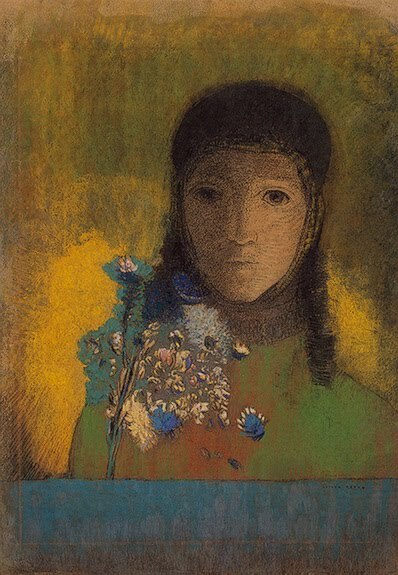 Indeed, in this portrait there is a real sense of the connection between the two characters directly involved in this work. The subject’s gaze, directed towards the artist, with a single raised eyebrow, seems to offer a challenge; the confidence of the woman is met by the confidence of Sargent’s brushstrokes, and in this way we have a kind of audacious interplay between the two characters. The face is the most closely painted and therefore the focus for the viewer. Sargent is much more concerned with where the personality of his sitter is concentrated, possibly the least feminine area of the painting. The gender relations of the work are hidden in the understanding of what this painting actually is; the portrait as a sign of power. Though the subject is a woman, the work is really about the husband of the sitter who commissioned it, who will eventually own the work and display it in his house. The title of the work is ‘Lady Agnew of Lochnaw’; the husband’s title and the husband’s name, no part of this name is carried over from before marriage: we do not even learn the sitter’s first name. Sargent understood that it was his job to paint people at their most elegant; his sitters are always dressed in contemporary high fashion as an expression of the hierarchical society in which they lived. Furthermore, this is clearly a contrived composition; the setting is suggestive to a modern-day viewer of a photographic studio with the chair set before a hung backdrop. The large gleaming jewel around her neck, the gold bracelet on her wrist and the sumptuous fabrics of her dress are all included to indicate the wealth of Sir Agnew. The sitter lounges on a contemporary piece of furniture, indicating the wealth and good taste of the owner. In the background there is a piece of patterned fabric which appears to have oriental characters on it. Perhaps this is a reference to the vogue for oriental objects in Britain in the second half of the nineteenth century (the necklace also has a sense of the exotic about it with some sort of delicate blue beading around the outside of the gold setting); this is again about possession and displaying the status of the patron. The technique of the work is also an interesting point to discuss. There was a general understanding amongst art critics of the nineteenth and twentieth centuries that certain styles of painting could be considered more masculine or feminine than others. Such assumptions were challenged by the Impressionist and Modernist painters, and it could be argued that the glossy strokes of Sargent challenged ideas of a masculine style as strongly as those of Manet and Monet. No-one could debate the masculine tone of the portraits of, for example, Van Dyck, but Sargent’s voice is softer and more sensitive, concerned with his sitters on an emotional level. It has been noted that Sargent’s style could be the reason why he received so many commissions for female portraits as it ‘made him especially good at interpreting the feminine character’ and certainly, Sargent’s style is central to the communication of the sentiment of the work. However, there is a confidence and boldness that prevents his work seeming effeminate. It is possible to argue that Sargent’s portrait of Lady Agnew of Lochnaw challenges several stereotypical gender assumptions. Sargent’s subject displays none of the fragility of the female figure, as she fixes the viewer with a defiant and challenging gaze. She has a real strength of purpose and self-awareness in her seemingly relaxed pose. Her slender frame fills the broad chair in which she arranges herself. Although she sits on a floral patterned chair and she wears an elegant fashionable dress, this portrait does not emphasise the feminine, either in Lady Agnew’s appearance or character. It is interesting that the only part of the painting that is most clearly defined is the head of the sitter, the least feminine part of the painting. She has her hair pulled back in a manner which denies any ladylike – or even era-specific – fashion. This area is also where the darkest tones in the work are concentrated, again emphasising the focus of the work on the sitter’s head. She holds a flower in her right hand, a feminine symbol, though whether there was any specific symbolism attached to this flower is unclear, and Sargent does not accentuate this area of the painting, rather camouflaging it in the similar tones of the dress. Perhaps this particular piece of iconography is more about creating a sense of togetherness with the compositional features of the work than any suggestion of femininity; Sargent paints the petals of the flower with the same materiality that is afforded to the sash of the dress, and the motif of the flower is repeated in the fabric design of the backdrop to the right of the composition. Though there are obviously strong themes of ‘possession’ in any interpretation of this work, the sitter does not appear to be naive to this. Perhaps, like Sargent, she chooses to accept and work within the status quo in order to secure herself a comfortable and relatively free existence. The success of this portrait launched Lady Agnew on to London society as a celebrated beauty, and on the back of this fame, she was able to set up her own salon. Ormond, ‘Introduction’ in Uncanny Spectacle, 1. Griselda Pollock, ‘Women, Art and Ideology: Questions for Feminist Art Historians’, from Women’s Art Journal, Vol. 4 No. 1. Spring – Summer, 1983 (USA: Women’s Art, Inc., 1983), 43. Pollock, ‘Women, Art and Ideology’, from Women’s Art Journal, 43. Berger, Ways of Seeing, 46. Gill Perry, ‘Introduction: gender and art history’ from Gender and Art (London: Open University, 1999), 17. Berger, Ways of Seeing, 47. Clark, ‘On the Social History of Art’ from Image of the People, 15. Perry, ‘Introduction’ from Gender and Art, 14. Quoted in Reynolds, ‘Sargent’s Late Portraits’ in John Singer Sargent, 162. Ormond and Kilmurray, John Singer Sargent, xxiii. A Companion Guide to the National Gallery of Scotland, (Edinburgh: National Galleries of Scotland, 2000). Berger, John, Ways of Seeing (London: Penguin books, 1977). Clarke, T.J., ‘On the Social History of Art’, in T.J. Clarke, Image of the People: Gustave Courbet and the 1848 Revolution (London: Thames and Hudson, 1973). Kilmurray, Elaine and Ormond, Richard, John Singer Sargent: The Early Portraits, Complete Paintings Volume I (New Haven and London: Yale University Press, 1998). Nochlin, Linda, ‘Women, art and power’ in Women, art and power and other essays (London: Thames and Hudson, 1989). Ormond, Richard, ‘Introduction’ in Marc Simpson Uncanny Spectacle: The Public Career of the Young John Singer Sargent (New Haven and London: Yale University Press, 1997). Perry, Gill, ‘Introduction: gender and art history’ in Gill Perry, Gender and Art (London: Open University, 1999). Pollock, Griselda, ‘Women, Art and Ideology: Questions for Feminist Art Historians’, in Women’s Art Journal, Vol. 4 No. 1. Spring – Summer, 1983 (USA: Women’s Art, Inc., 1983). Reynolds, Gary A., ‘Sargent’s Late Portraits’ in Patricia Hills, John Singer Sargent (New York: Harry N Abrams. Inc., Publishers, 1986. Søndergaard, Sidsel Maria, Women in Impressionism: Mythical Femenine to Modern Women (Italy: Skira Editore S.p.A., 2006). As this blog testifies, a few weeks ago I had the privilege of joining the Music in the Round team to help run an auction to raise money for their Ebony and Ivory Fund. Music in the Round - who recently won the Chamber Music and Song Award at the Royal Philharmonic Society Awards - are primarily based at the Crucible Studio Theatre in Sheffield, where they hold a weeklong festival of talks, events and concerts every May. This is led by their musicians in residence, Ensemble 360, and also features exquisite guest musicians, who this year included pianist Viv McLean and sitar player Jonathan Mayer. The entire festival this year, which was entitled 'Turtle Soup: The Curious Story of Music in Britain', was truly extraordinary, but for me the concert that most affected me was the concert entitled 'Celebrating Britten'. On the Thursday evening Ensemble 360 performed with the 'internationally renowned tenor' John Mark Ainsley with an evening of Britten and English poetry. It felt apt having this performance with the public dress of Alan Bennett's 'The History Boys' going on next door on the Crucible Mainstage; the performance featured settings of poems by Thomas Hardy, W H Auden and A E Housman - all of which feature in the play - and the play that Bennett wrote after 'The History Boys' ('The Habit of Art') describes an imagined meeting of Britten and Auden. However, much as I love the text of 'The History Boys', I would not have been anywhere else on Thursday night. 'Powerful' doesn't cut it. Beginning with the first half, which featured settings of Hardy by Britten. The poetry and the music are of course strong creations in their own rights but together the eloquence of the poetry is given more life and a theatrical lilt which was never false. Britten wrote some extraordinary operas and this gift is apparent in his songs, but there is a slight vulnerability and isolation from having just one singer. The singer in question - Mr Ainsley - acted his socks off, delineating personalities and sentiments that ranged from jovial love to existential desolation. He also performed Britten's first and third Canticles - the former a love song to his beloved, and the latter a reflection on the Blitz. Having delved deep into paintings of the blitz I have engaged with the struggles of communicating the psychological effects of living with the threat of falling bombs, but this piece seemed to brilliantly bring together feelings of normality (the poem uses the refrain 'Still falls the rain') with the quiet grief of an actual normality lost. The concert is a fine example of the strength of Music in the Round's programming - bringing together established canonical composers with the new and the hip (the second half featured the stunning James Macmillan and Ireland, two contemporary composers, as well as Frank Bridge and Vaughan Williams). The unique setting of the Crucible Theatre allows for a heightened sense of drama; the audience is not only up close and personal with the performers, they are part of the performance. In the way that when you go to the theatre, if the audience laughs heartily at all the jokes then each individual player has more fun, in this space the response of each audience member becomes part of a shared consciousness in the whole room. We are participants in the performance, entering into a conversation with the music. 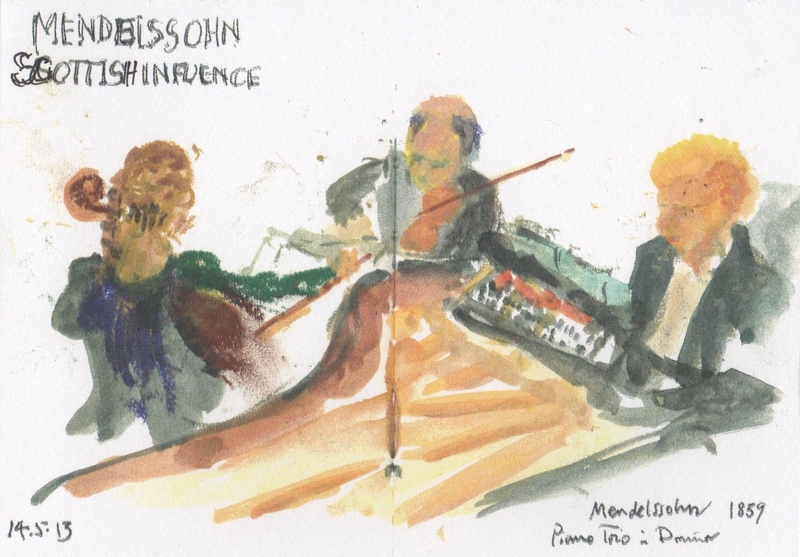 This is chamber music as it should be.